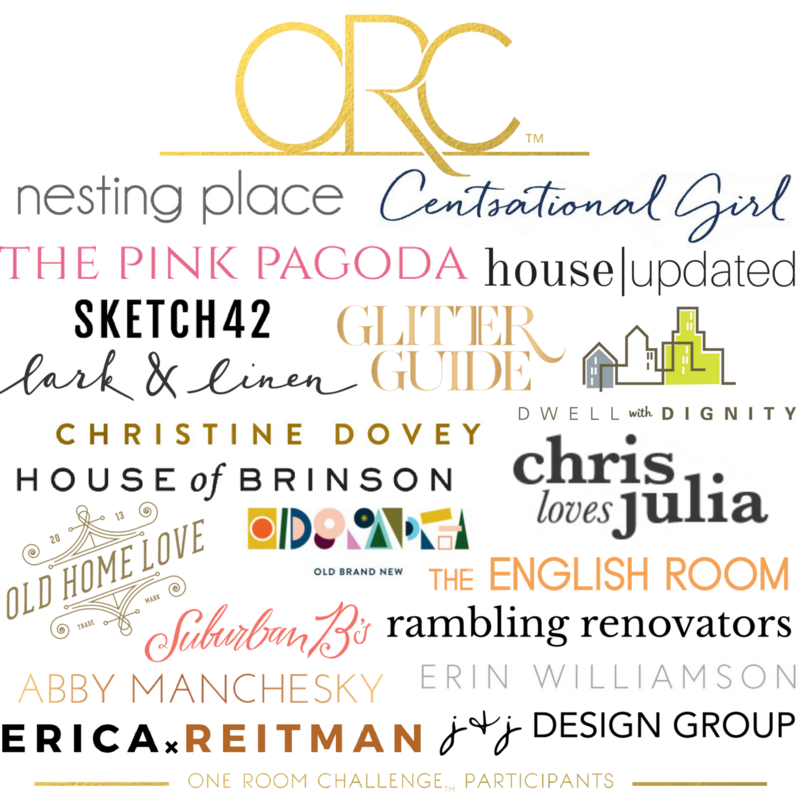 OMG, friends, it's WEEK 5 of the One Room Challenge, hosted by Calling It Home and media partner House Beautiful. That means mere days to get this living room together! I KNOW. How the heck are we going to get this room done in time for photos to be taken on Sunday?! But before I start hyperventilating, let's celebrate the small wins this week, shall we? Moulding installation and wall painting - done and done! I'm proud to say we did all this work ourselves and it looks pretty darn awesome. Installing moulding is not actually all that difficult. It's the back and forth to the garage, measuring and remeasuring, filling nail holes, sanding, painting, painting and more painting that just takes a lot of time and effort. And we put ALOT of moulding (from the fabulous One Room Challenge sponsor, Metrie) in this room so it took a really really long time. The gorgeous custom Barrymore sofa arrived and it is everything I dreamed of. Even under that unattractive plastic you can see its sinkable, soft, velvety goodness. I can't wait to actually sit on it, ha! But, crappy iphone pic aside, you can start to see the colour palette of this room coming together. Cool greys + warm whites + deep navy. I am loving it! The fireplace also received a mini-facelift. The mantel is original and in fantastic condition and we made it feel fresh by repainting it the same colour as the wall (Ammonite by Farrow and Ball). The tiles and surround, however, are in bad shape. The marble surround has a rather large crack in it and the hearth tiles are just unattractive. But, in the very near future, we plan to refinish the floors in this room so we decided to hold off on replacing the tile and stone for now. So, as a temporary fix, I painted all of the red and brown hearth tiles with Rustoleum Chalk Paint in Charcoal. It's a nice matte finish and makes the tiles look like slate. Good enough for now. One of the biggest accomplishments in this room was the install of the built-in cabinetry by the team at GLA Interiors. There are certain things I believe in DIY'ing and others where I am more than happy to hire the pros. This was one of those instances. The cabinets are high quality, finely detailed (I love the register cover in the base), and were built to last. There are so many more fun details going into this area but for now, Chloe is content to claim that bench space as her own. More lovely accessories have arrived courtesy of generous ORC sponsors. While the bones of this room feel grand and traditional, I want the space itself to feel welcoming, livable, kid-friendly, and not so serious. Textures and soft goods can do that. 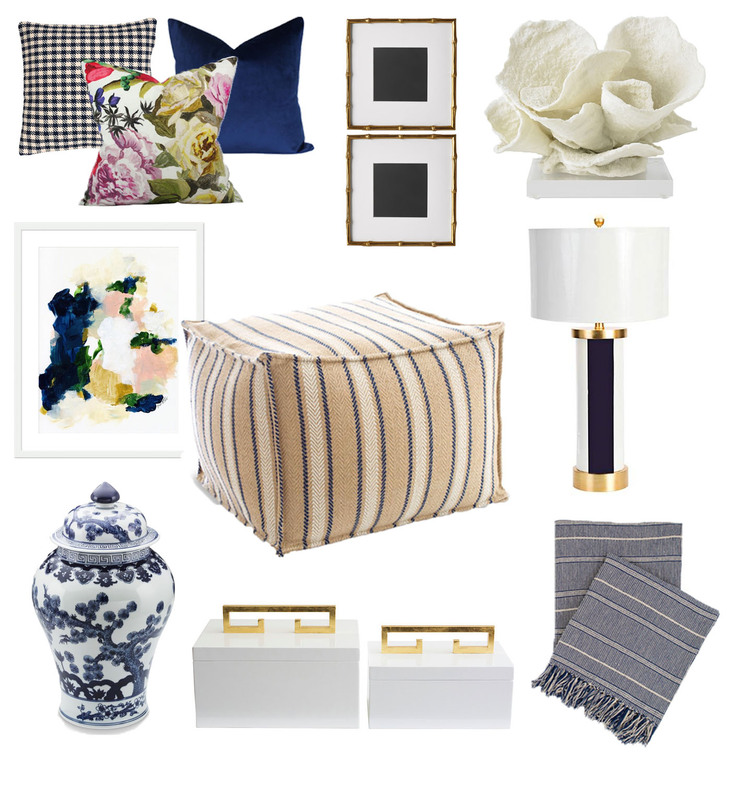 The pillow story is playful and preppy with a mix of houndstooth outdoor pillows from Annie Selke, blue velvet from Tonic Living, and a gorgeous pillow from Arianna Belle in one of my long-time favourite patterns, Orangerie. 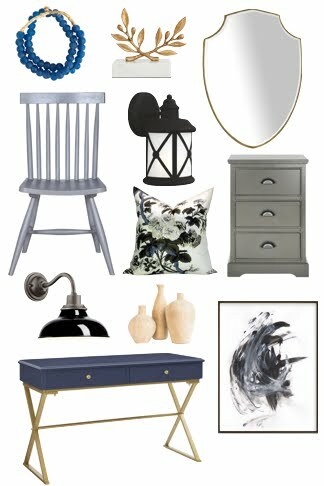 I've kept the blue + camel colour scheme going with the Dash & Albert Samson Navy Cotton Throw, and the seriously fun Cambridge Navy Indoor/Outdoor Pouf. I envisioned placing the pouf alongside the bench, to act as an ottoman, or floating around the room as extra seating when needed. But the room does need hits of sophistication. The oversized coral, gold bamboo frames, and ginger jar from Williams Sonoma Home bring it in spades. Timeless and classic, these are the kinds of pieces that will work in most any room and add polish to the design. Likewise, the Newport table lamp and greek key boxes from Candelabra feel current yet not too trendy. 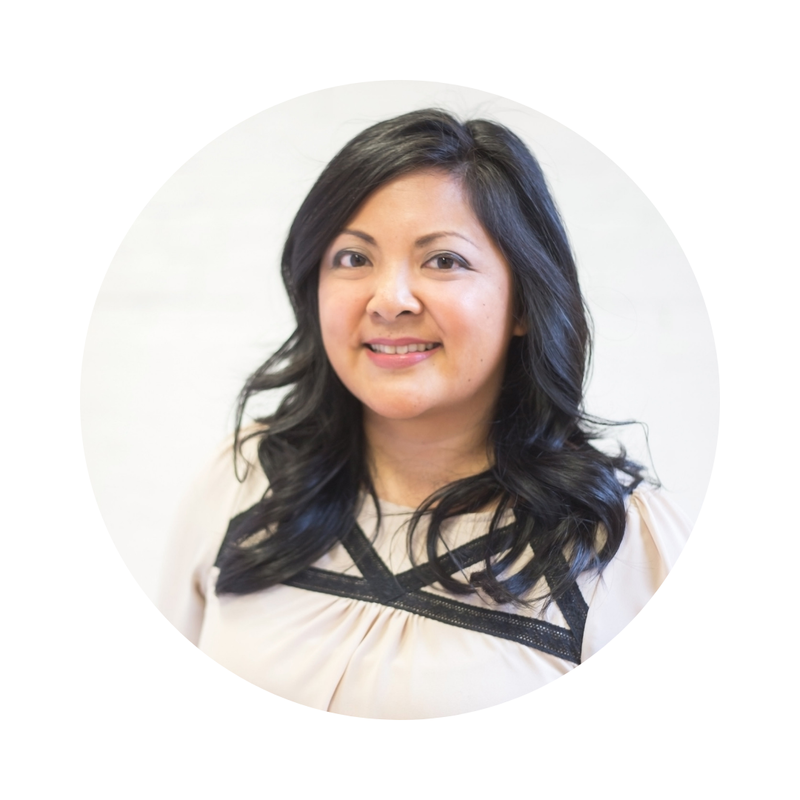 Finally, art from Parima Creative Studio will help tie everything together. I worry sometimes that I'm too "matchy" with my art, but as long as you love it, it works. All that in between working our day jobs, a school concert on Thursday night, and before the photographer arrives on Sunday morning. Ahhhhh!! Okay, enough talking, I've got to get back to work! 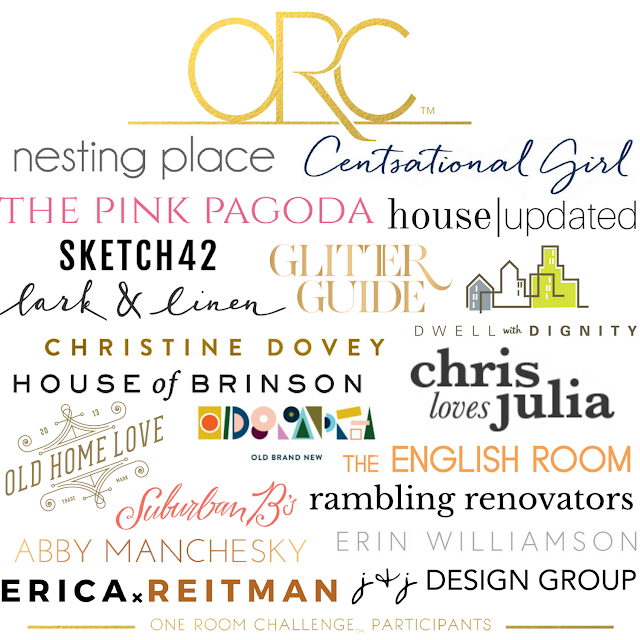 Go check out the other featured designers today and the 200+ participating guests on Thursday. Good luck everyone - let's get this done! Thank you to these amazing sponsors and businesses who are helping to bring this room to life.